Use the links below to jump to the question you're interested in. How will my purchase appear on my credit or debit card statement? Can I come pick up my order from your warehouse? How do I pay for my new scale? Are you a CCR (Central Contractor Registration) supplier? What is your DUNS (DNB - Dun & Bradstreet) number? Old Will's website utilizes the most advanced 128 bit SSL (Secure Socket Layer) EV (Extended Validation) security certificates available on the market, offering the highest level of encryption and security possible. When ya place your order with us, your purchase will appear on your credit card or bank statement as either "WEIGH SCALE" or "SCALE PURCHASE". We ship to folks in the good ol' USA... all 50 states and APO/FPO locations (in honor of our hard workin' troops abroad). You may have your order sent to a freight forwarder, however, once it leaves the US we are not responsible for return shipping if the product arrives defective. If your payment is received before 2:00 p.m. Mountain Time on any business day, your order will ship the same day. If we receive your payment after 2:00 p.m., your order will ship out first thing in the morning on the next business day. Some items ship from other locations and may require up to an additional week for processing. Please feel free to contact us if you need your order to arrive by a specific date. We'd be happy to check on lead times for the products you're interested in. Please also make sure to provide your email address and phone number when ya place your order, so that in case we find out about any possible delays in shipping, we can let ya know. 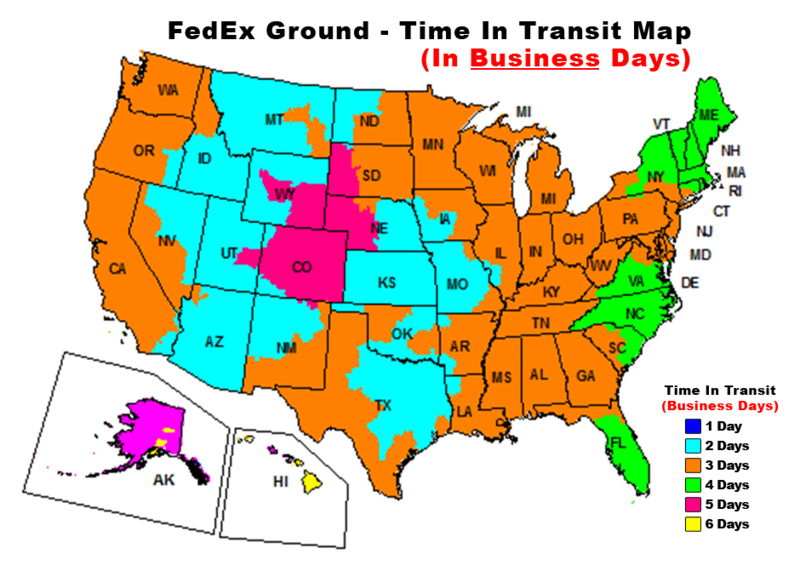 • FedEx Money Back Guarantee? For Old Will, and many other companies in the United States, FedEx has stopped supporting their Money Back Guarantee program which offered a refund on shipping for late deliveries. 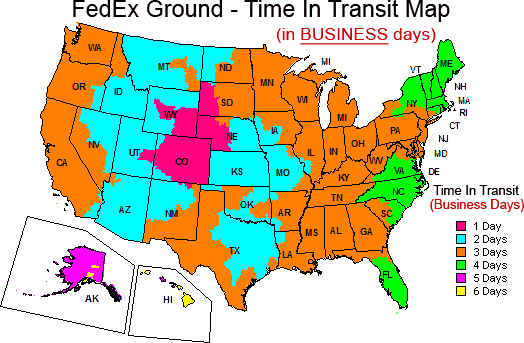 • See FedEx Ground Map for our location (80241) below. Please keep in mind that eight of the brands we carry, Adam, A&D, Citizen, Detecto, Health o meter, Ohaus, Penn, and Seca, are shipped directly from the manufacturer's warehouse, and are sometimes not shipped out until the next business day. All of the rest of our models ship out of our warehouse here in Colorado. If you're really in a hurry for your scale and are in the Northglenn area, you can stop by during our business hours to pick up your order. You must give us a call before you stop by. We are not set up to accept cash as a payment method. 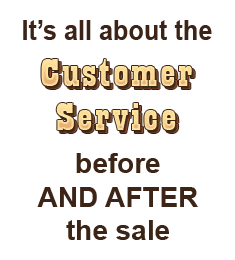 We don't stock everything here and your order will need to be paid for over the phone before you arrive. Payments on your credit card or bank statement will appear as "WEIGH SCALE", or "SCALE PURCHASE". Money Orders Orders placed with a money order payment will ship once your money order is received. Checks, from verifiable businesses or schools only. If we're unable to verify from multiple sources that a business or school exists, we unfortunately can't ship your order until 14 days after we receive your check. All orders paid by personal check will be shipped 14 days after we receive your check. Sales tax will be added to your order if ya live in Colorado, Georgia, Illinois, Indiana, Maryland, Michigan, Minnesota, New Jersey, North Carolina, Oklahoma, Pennsylvania, Washington, or Wisconsin. Old Will hates spam just as much as you do. We don't share your personal information, or your email address, with ANYONE. Period. No... our website is our catalog. Our site will tell ya all ya need to know about our products (and then some). You bet. If you're needing large quantities of scales, we're happy to provide discount pricing. Before ya CONTACT US about pricing, please be prepared to let us know the zip code we'll be shipping to, exactly which model(s) you're interested in, as well as how many of each model that ya need. Please note: Not all scales are eligible for quantity discounts. You bet. Feel free to spend your federal dollars with Old Will :o). You can view and print our W-9 here. In most instances, a signature is not needed, however, if you require that information please contact us. We'll get one signed, dated and sent your way.